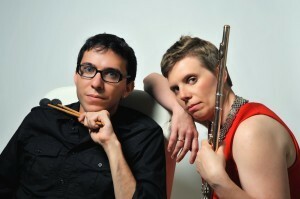 The duo of Zara Lawler, flutist, and Paul J. Fadoul, marimbist, will perform Feb. 3 at 7:30 p.m. in Sydnor Performance Hall. The duo offers audiences arrangements of classics to newly written pieces for their unusual instrumentation, and even includes a few one-act plays. Lawler & Fadoul have a long history of collaboration, both as a duo, and previously, as members of the innovative ensemble Tales & Scales. Since 2004, they have performed together in many of the country’s most prestigious venues, including the Kennedy Center, Strathmore, the Cerritos Center, the Kravis Center, Trinity Wall Street, and the Tribeca Performing Arts Center. Lawler & Fadoul are teaching artists for the National Symphony Orchestra in Washington, D.C. On behalf of the NSO, they create in-school interactive concerts for children from pre-K thru 6th grade, and perform in public schools throughout the D.C. metro area.